Based on the annual New York Fashion Week, Pantone has recently released its Fashion Color Trend Report for Spring 2018. Looking at the 12 colors, the key take away for next Spring is a colorful self-expression. Aside from vibrant shades that normally emerge during the season, untypical spring colors and basic neutral shades have also come to surface, providing a more divergent range of combination to the palette. 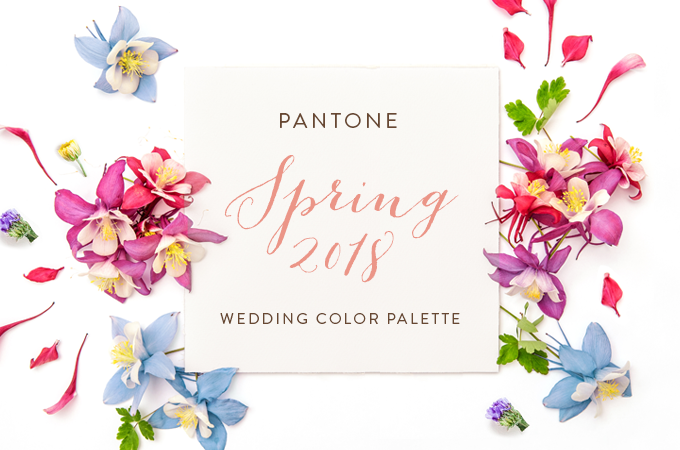 Pantone mentioned that the Spring 2018 is a palette that encourages a sense of fun and playful release; a sanctuary of color that's ideal for unique and dramatic color mixing. This description quickly brings to mind the on-trend tropical concept now popular among weddings. Hence, we took the liberty to create three wedding palettes inspired by the things we just might find during an escape to a tropical paradise. Note that there's more to a tropical concept than just exotic fruits and dashing colors. Through various approaches, a tropical concept can evoke an array of diverse atmospheres, including a delicate romantic feel. 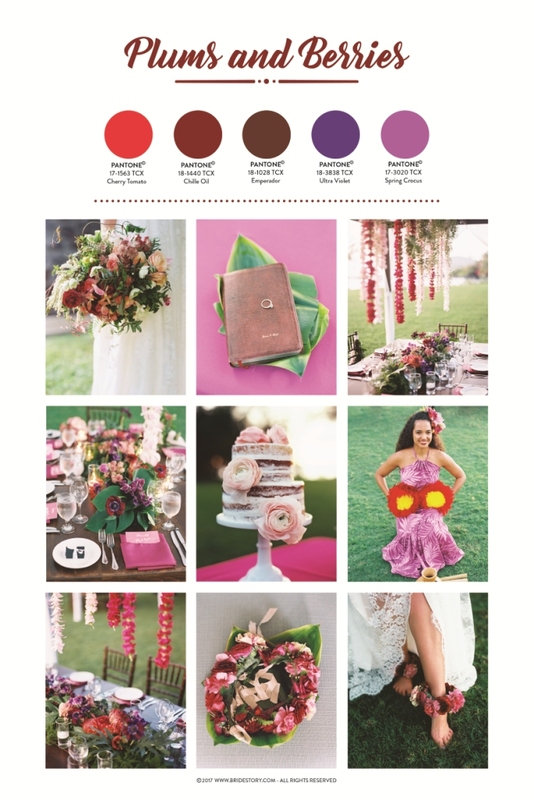 Scroll down to see the three palettes and see which one suits your client best! First up is Plums and Berries. At first glance, the five shades that formed this palette might not seem fit for a tropical wedding, but the mood board below proves otherwise. A feisty shade of red, Cherry Tomato brings forth the vibrancy to the whole composition. Whilst Emperador, Chilli Oil and Ultra Violet balance it out by providing a sense of depth to the palette. Finally, we chose Spring Crocus to act as a pop-of-color to infuse a youthful ambience to the palette. This palette is a beautiful mix between tropical and bohemian concept, resulting in a one-of-a-kind celebration that your client are going to deem as unforgettable. For an authentic tropical feel, look no further than this zesty palette, The Birds of Paradise. Inspired by the beauty of exotic fowls inhabiting the tropical islands, we chose to combine four of the most dramatic and vibrant shades of the spring colors to form this composition. Cherry Tomato makes yet another appearance, with Meadowlark and Arcadia, both bold and energetic colors. With the effervescent Lime Punch, the color takes this palette to another level with its sharp and pungent quality. If your client is planning a wedding in tropical beach that's filled with bright and dashing colors, then this palette might just be it for them. Should the palette feel too overwhelming, take one or two colors away and replace it with a neutral shade like Little Boy Blue or Pink Lavender, which can be seen in the next palette. Last but not least is Blushing Sunset. Inspired by the rosy skies as the sun falls to the horizon, we put these five softer colors together to create a more subtle approach to the tropical theme. 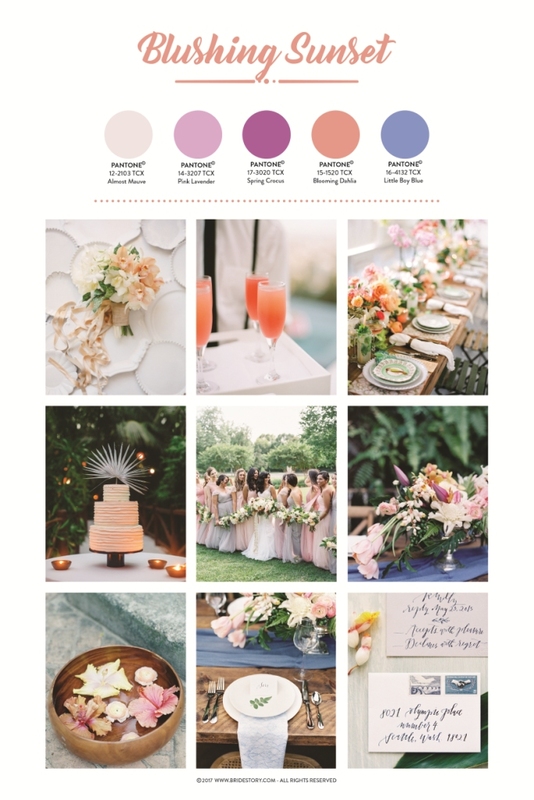 Almost Mauve, Pink Lavender, and Spring Crocus come across as gradient shades that can absolutely stand alone as a color palette for your client wanting a romantic wedding. The addition of Little Boy Blue, an Azure blue shade, and Blooming Dahlia, a warm peach color, brings the tropical vibe to the whole composition while still keeping it as delicate and elegant as ever. This palette becomes proof that even with a seemingly brave theme, you can still pull off a dreamy celebration with an understated beauty. 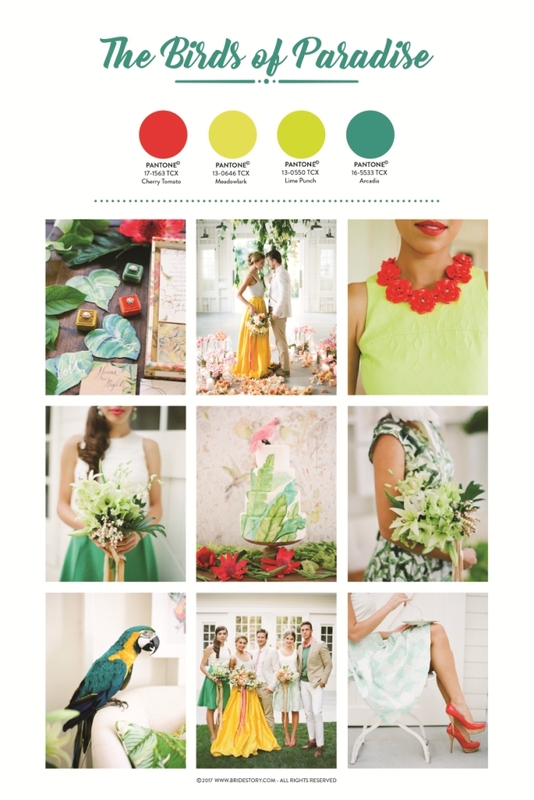 Of all the palettes we create above, do you have any combinations in mind you think would make a great tropical wedding? Share us your favorite combinations on the comment box below!